Our reviewers looked at 39 different Vacuum Sealers including 2 from Hamilton Beach. We reviewed each vacuum sealer for features offered, ease of use, quality, and price. We feel that the best Hamilton Beach BRAND Vacuum Sealer is the Hamilton Beach 78220. You can compare this model to one of our top recommendations the NutriChef PKVS18SL which we feel is a much better value for your money. Use our Comparison Table below for more information and links to our full detail reviews.If you are looking to replace a lost set of directions visit our Hamilton Beach Instruction Manuals page. 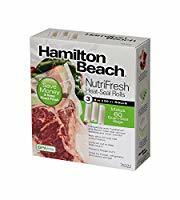 Our reviews show the best Hamilton Beach Vacuum Sealer is the Hamilton Beach 78220 it offers the best combination of features, ease of use, and price. However this model scored below average, and we only recommend it for people who will be using a vacuum sealer occasionally or looking for a Budget Priced Vacuum Sealer. If you are replacing a broken vacuum sealer, we think you should avoid this model, as the quality for this model was definitely below average. 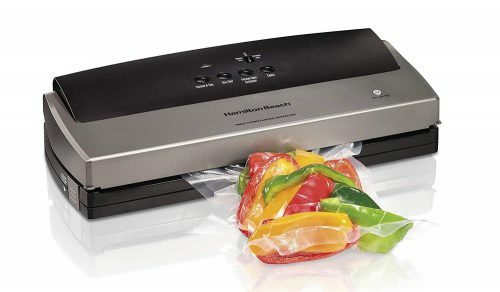 We recommend the Hamilton Beach 78220 vacuum sealer, which we feel is a much better value for your money. 6" x 10" x 17" 7" x 16" x 4" 6" x 14" x 3"
All of the Hamilton Beach Vacuum Sealers are manually operated vacuum sealers. You can use them with bags or rolls, the Hamilton Beach 78220 comes with built in bag roll storage. They all work with both wet and dry food items. All Hamilton Beach Vacuum Sealers come with a 1 year warranty, and make a perfect companion for someone getting ready to start sous vide cooking. Do the Hamilton Beach Vacuum Sealers come with a starter kit of bags? Yes both models come with an Comes with starter kit which includes: 11" x 20' heat seal roll, (4) gallon-size bags, (6) quart-size bags. Can the Hamilton Beach Vacuum Sealers be used to seal bread? The Hamilton Beach 78220 comes with a pulse mode, which allows you to seal delicate items like breads. Can the Hamilton Beach vacuum sealer work with vacuum seal canisters? Yes the Hamilton Beach Vacuum Sealer does work with containers and Vacuum Seal Canisters - canisters. An accessory hose comes with 78220, however you are going to need to purchase an accessory hose for the 78213. 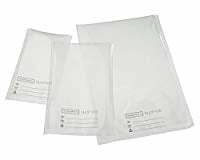 Can I use any brand of vacuum sealer bags? 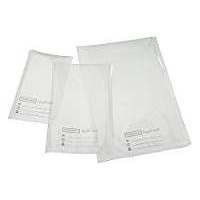 Different manufacturers have their vacuum sealers seal at different temperatures, so you should always use bags the vendor says are compatible. 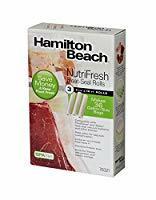 Hamilton Beach Vacuum Sealer Bags and rolls will only work with Hamilton Beach models. 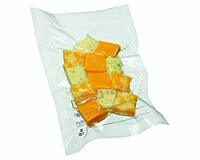 Additionally they aren't very competitively priced, we think OutOfAir Vacuum Sealer Bags make a much better choice.